2001 Recession, Its Causes, Impact, and What Ended It. The 2001 recession was an eight-month economic downturn. It began March 2001 and lasted through November 2001. The economy contracted in the first quarter, January to March, by 1.1 percent. It improved to 2.4 percent in the second quarter, April to June. It contracted again in the third quarter, July to September, by 1.7 percent. The economy recovered in the fourth quarter, October to December, growing 1.1 percent. Unemployment reached 5.7 percent in December 2001. That's a little more than the natural rate of unemployment. Unemployment continued to climb even after the recession ended. In June 2003, it reached 6 percent. Employers waited to lay off workers until orders were strong enough. As a result, the unemployment rate is a lagging indicator. The Y2K scare caused the 2001 recession. Y2K stands for the Year 2000. Experts falsely warned businesses of a Year 2000 software problem. They said the operating code had to be able to understand the difference between 2000 and 1900. Many fields within that code only had two spaces, not the four needed to differentiate between the two dates. Many companies and individuals bought new computer systems to make sure their software was Y2K compliant. To avoid a catastrophe, companies drove an economic boom in computer and software sales. As a result, the stock price of many high-tech companies started to increase. Investors' began buying stock in any high tech company, whether they were showing profits or not. The exuberance for dot.com companies became irrational. The boom led to a bust in dot-com businesses. It became apparent in January 2000 that computer orders were going to decline. The shelf life of most computers is about two years. Companies had just bought all the equipment they would need. As a result, the stock market dropped in March 2000. As stock prices declined, so did the value of the dot.com companies and many went bankrupt. The Federal Reserve ignored the markets. It raised the fed funds rate three times, reaching 6.5 percent in May 2000. The Fed kept interest rates high when the economy needed low rates for cheap credit. The 9/11 attack worsened the downturn. The New York Stock Exchange closed for four trading days after the attacks. That was the first time since the Great Depression. The stock market reopened on September 17, 2001. The Dow Jones Industrial Average fell 7.13 percent, closing at 8,920.70. The 617.78 point loss was the Dow's worst one-day drop at that time. For reference, historical tables on U.S. gross domestic product growth, U.S. GDP history, and U.S. inflation rate have annual statistics that go back as far as 1929. The Bush administration helped to end the recession with expansionary fiscal policy. Immediately upon entering office in January, President George W. Bush began working with Congress to cut taxes. On June 7, 2001, Bush signed the Economic Growth and Tax Relief Reconciliation Act of 2001. It gave income tax relief to families retroactive to January. That covered them for the entire 2001 tax year. The administration believed they would spend the extra money and boost economic growth. EGTTRA lowered the maximum tax rate from 39.6 percent to 35 percent. It reduced the 36 percent rate to 33 percent, the 31 percent rate to 28 percent, and the 28 percent rate to 25 percent. It reduced some of the 15 percent tax rate to 10 percent. It also expanded the Earned Income Tax Credit. EGTTRA also doubled the standard deduction. It raised the threshold for the 15 percent tax bracket for married couples. It doubled the child tax credit from $500 to $1,000. These cuts gave taxpayers more money to spend. This increase in demand would boost the economy and lift it out of recession. Some of its other provisions benefited retirement savings and estate taxes. Those measures wouldn't help the recession. They might promote saving instead of spending. The second cause for the end of the recession was the War in Afghanistan. In its first year, Congress appropriated $29.3 billion in emergency funding for the war. 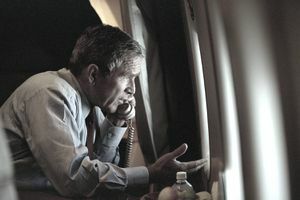 President Bush launched the war to find and bring to justice Osama bin Laden. He led the al-Qaida terrorist group responsible for the 9/11 attacks. The third reason the recession ended was the Federal Reserve's expansionary monetary policy. It began lowering rates in January 2001. The fed funds rate history reveals how the Fed steadily lowered them about a one-half point each month. By December 2001, the rate was 1.75 percent. Lower interest rates made homes, education, and auto purchases less expensive. Although the recession ended in November 2001, the threats of war drove the Dow down for another year. It hit bottom on October 9, 2002, when it closed at 7,286.27. That was a 37.8 percent decline from its peak. No one knew for sure if the bull market had returned until the Dow hit a higher low on March 11, 2003. It closed at 7,524.06. The tax cuts were phased in through 2009, too slowly to boost the economy. Economic growth was 1 percent in 2001. It increased to 1.8 percent in 2002 and 2.8 percent in 2003. To solve this, Congress passed the Jobs And Growth Tax Relief Reconciliation Act in 2003. Its goals was to speed up the tax cuts and give breaks to businesses. Second, many people saved their rebates instead of spending them. Tax cuts went to everyone, regardless of income. Those with higher incomes are more likely to invest rather than spend any tax cuts. The response to the 2001 recession set the stage for the 2008 financial crisis. The Fed continued lowering interest rates through 2003. That forced banks to earn less revenue. They looked for other sources, such as mortgage-backed securities and other derivatives. When the Fed began raising rates in 2004, many mortgage-holders had trouble paying the higher rates. In the long run, the Bush tax cuts hurt the economy by dramatically decreasing government revenues. That increased each year’s annual deficit, and thereby the U.S. debt. Congress fought against President Barack Obama's jobs bill because it was more concerned about the debt. Instead, it forced a 10 percent spending cut with sequestration. That contractionary fiscal policy made it harder to recover from the Great Recession. Was the Big 3 Auto Bailout Worth It? Can Donald Trump Bring Back American Jobs? What Is Libor and How Does It Affect You?